I saw a bird today that I just cannot identify. I live in a suburb of Stuttgart, Germany, and I often see large birds like pheasants from the window of my flat. 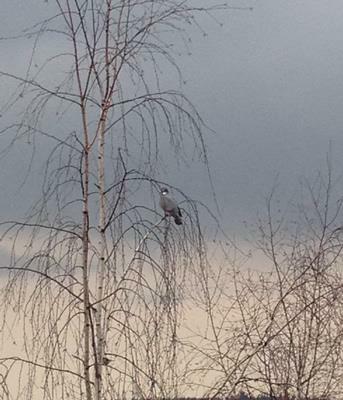 Today I saw a large grey bird, with a turquoise head and a white band around its neck. It was sitting in the top of a tree, and at some point it bobbed its head from side to side. Soon after, the magpies chased it away. 8 Looks a lot like the doves we have here in Netherlands.